I have been self-debating for months if I should even rant about this iffy, controversial and touchy topic. After much deliberation, I decided to bite the kibble and say now or forever hold my peace. And because it is known that my brood is on Wellness Pet Food (the dogs and cats) and more so, Flapper and Frodo are sponsored. So I, Flapper Mummy, received flak for 'trying to kill my pets'. Okay, the peeps did not say outright but it was indicatively so. It was also clear that if I tried to defend the food in any way, it would be perceived as bias or blind-defense or feeble or... whatever superlative that could be thrown my way. Of course I was a concerned mama. The very catchy headlines of "Lawsuit Against Wellness Dog Food" and 'Wellness Pet Food Contains Undisclosed Arsenic" was misleading enough to believe it was ALL the dog food involved. The first question that popped into my head was, "Did I really trust the wrong brand of food for my pets? Am I really poisoning them?" I whipped out my Sherlock pipe and magnifying glass to investigate a little more and started to smell a fish (pun intended). The plaintiffs are 'an individual' and the owner of a U.S. based dog daycare business. I could not fathom in my naive head why two individuals would spend all that money to send the food out for testing in the first place. Are really that righteous over... dog food? If they were all that concern about these metal levels, sense and sensibility would have dictated them to stay away from the fish/seafood based diets for their dogs, no? Then again, they are from another part of the world where any reason could be a reason for a legal suit. In addition, should they win the case, they would earn back the testing and legal costs... and possibly even more. So okay, lawsuit makes financial sense. Then I went to snoop into that 'doctor' whose article was flashing on Facebook. In fact, that was the first article I read and of course it caused me a shock-wave of emotions. Surely the doctor tells the truth. Holy crap! I am killin' my pets! I discovered this exciting website called 'Clean Label Project' (CLP) which, as the above quotes read, test products for contaminants and toxins. I had to see where Wellness Pet Food was sitting at! CLP has modified their ratings system since I last went in to snoop last August. It was, then, only focussed on contaminants rating but I cannot even remember specifically which category. So during that time, Wellness Pet Food had overall, for lack of better word, dismal rating. Note: The ratings have changed since as they include a wider range of contaminant rating and nutritional superiority. So where Wellness sits now is overall good rating on 'heavy metal contaminant', 'process contaminant' and 'nutrition superiority' but its 'byproduct contaminant' is badly rated. However, what was (and still is) topping the charts (best food with least contaminants) were those freeze-dried and raw dehydrated food. And since I was on Sherlock mode, I had to consider looking into those feed for my animals right? So I zoomed right into Stella & Chewy's range of freeze-dried food. Stella & Chewy's was also the top-rated food on CLP at that time. But most importantly, should I consider switching my brood away from Wellness Pet Food which also means goodbye sponsorship, I had to see how much damage it was going to cost me. Freeze-dried food is notoriously expensive. So first thing I did was to pull out S&C price list to see what was available in Singapore before visiting S&C's website to see the feeding requirement. I burst out laughing when I saw the feeding guidelines. It stopped at 40 lbs body weight! Flapper and Frodo are approx. 70 lbs (31kg) each so erm yeah! I had a suspicion these trendy freeze-dried food are not meant for bigger dogs... financially. Anywoof, so for calculation sake, I am going to assume a 70 lbs = 40 lbs + 30 lbs of feed = 19 pieces of nuggets per month. Ms Excel, here I come! 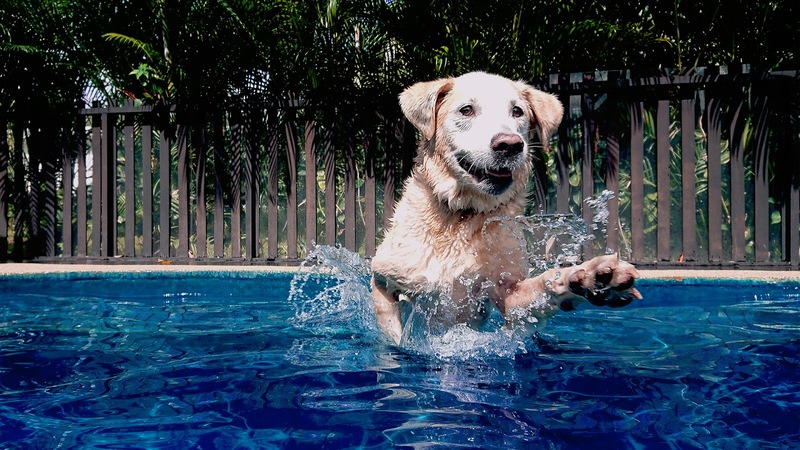 A whopping $2,000.00 (SGD) per month for all three dogs excluding the cats. Okay dogs, as much as I love you but 2k is seriously stretching it. I had to have a look at these raw and freeze-dried diet for interest sake. It is such a trend and rave by these holistic experts encouraging raw diet that surely the mama cannot ignore. I have severe reservations about raw diet with the thoughts choo-choo-ing on proper storage to possible contamination thanks to our lovely humid weather leading to diarrhoea leading to possible Giardia.... So raw freeze dried seems like a safer option though I was sternly warned once to discard the expensive nugget should it drop on the floor. My interest in freeze-dried diminished as quickly as my interest in the growing raw-feed trend. But I was still fixated on proving to myself that I did not make a dire mistake of Wellness Pet Food. The statistics on CLP, at that point, were not very much in its favour. But, without doubt, Wellness Pet Food still stood highly in terms of its nutritional value based on Dog Food Advisor. What the fish should I do? I started lamenting to my trusted advisors about the flak I was receiving over this Wellness lawsuit. I was in self-induced stress mode as well because I felt moral and ethical responsibility towards other dog owners as my boys represent the brand. At that point, I was questioning Silversky Pets on WellPet's response towards the lawsuit. I've deleted the statement released by WellPet from my phone. Grrrrr. A press statement is just a statement until proven otherwise. Based on the statement, I was interested in their 'internal lab test' on the safety levels of the food. To date, still nothing to be seen and I guess it is probably a case of silence to let the bad news tide over because surely another pet food company will have a visit from the lawsuit homing pigeon. Every other pet food company is getting a lawsuit these days. Anywoof, none of my trusted advisors were deeply surprised it was the fish formulas that were in question for its level of metal contaminants. So we got into discussions about safe consumption of fish and seafood. In the midst of this lawsuit chat, someone let slip a tale about a dog owner who sent her dog's blood for testing on heavy metal toxicity contents. This dog was on some super healthy home-cooked diet. I cannot remember all the details pertaining to this story so I cannot remember the protein-source or what this home-cooked formula contained. I was shocked by that story. And that was when that moment of epiphany hit me. If home-cooked food is not spared from heavy metal toxicity then what is the real problem? It is still called humans. I am not saying that pet food company, which are run by humans, are innocent of the growing claims. Pet food, at the end of the day, is a commercial product part of a multi-billion dollars industry. All the 'additional unstated perks' added into any given brand of commercial pet food is expected. That risk, as a pet owner, should be well-recognised and accepted. IF pet food companies were ethical, there would not be a gazillion of fish and seafood diets available for pets to consume. Pet food companies would take more effort in dissing the myth of cats eat fish. And if pet owners would stop that psychosomatic irrationality of chicken allergy (pay the money and get your dog allergy-tested! ), then perhaps fish-based diet would not be that trendy? Let's get real, if human food can be manipulated, surely pet food would not be any more glorious. And because of human's manipulation, comes the trend of 'organic food' which comes with a hefty price too, no? And yes, if fish-based diet can sell then which business owner would want to sacrifice their pockets? Then comes the newest report about yet another pet food recall by J.M. Smucker company because of phenobarbital level found in its food. Now that's another thing all together. Phenobarbital. My choice drug for suicide but to be found in food, that's another thing. Given that one cannot trust any human food in its raw form to be 100% safe for consumption - think added hormones, added God-knows-what-else to fatten up the calf, pesticides etc. etc. - then let's just for a moment take that even IF any given pet food manufacturer is ethical to the tee, what makes one think that the pet will still not be at risk? 100% risk free? I think not. So thanks to that story about that poor little doggie, it made me realise that there is no such thing as 100% safe food - pet or human food. Just as I am uncertain about the facts based on the lack of available data on Wellness Pet Food mortality rate, I am equally uncertain if WellPet may have compromised the quality of their products at any point of time by tweaking their formulas or change their suppliers because of bottom line. These are things that I will never probably never find out in Flapper's lifetime. Maybe Frodo's too. But based on what I can evaluate through my brood's health status, if Wellness Pet Food was that lethal, perhaps all five of them should be dead by now? Nine years on Wellness... that should be long enough to be used as evidence, no? Is It The Dog Food? Flapper, for the first time in his 11 years of life, started to develop skin problem round about the same time the lawsuit fiasco started. Flapper has always been trouble free when it comes to the skin and being plagued by skin problem after all these years was annoying. Very annoying. The annoying part was, skin problem can result in long term management and may or may not be resolvable. Prior to his skin problem, I have glanced through couple of reads about 'protein rotation'. It is said to have health benefits except that the recommended rotation includes changing brand of dog food, switching between different form of feedings (dry, wet, raw, home-cooked... whatever you can think of) and I was like, "Erm yeah, like I will be that hard working". And some say.... switching of brands is good just because one manufacturer's ingredient/additives could generally be the same stuff so the rationale for brand switch is to 'balance it out'. I have an irrational fear of switching dog food especially since I have never had any known problems with Wellness. Silversky Pets, being super supportive, agreed to allow the rotation of proteins. No, I was not going to dive into negotiating for Stella & Chewy's or other brands that they carry to be in the mix. I was happily conservative to just switch up the core protein from Wellness. Ah yes! That meant they went on that oh-so-fatal 'Ocean' formula for three months too. Flapper and Frodo with the different Wellness Core food as I embarked on the protein rotation. Coincidentally, at the time Flapper exploded with the skin problem, the boys had just switched to the Wellness Core Wild Game formula. Of course, I could easily say "It's the food's problem!" but this was not the first time he has been on this Wild Game formula so I was highly doubtful it was the cause. I was certain I knew what the contributing factor for that skin problem explosion - an obscene amount of chlorine in a particular swimming pool. There was another big factor to consider - Flapper IS old. His immunity will dip which means problems that he never used could 'suddenly appear'. However, due to the timeline, I was not going to discount that it could be the food as well. So just to be on the safe side, I decided to find a different formula. And since this coincided with the lawsuit, I had a serious decision to make if I should change the boys out of Wellness all together. Even momentarily could save me the agony from the flak I was receiving. I discussed with Mr D from Silversky Pets and was honest about the sudden skin problem. He was very supportive. He knew my loyalty to Wellness food. It has only been nine years so he knew it wasn't for whimsical fancy that I was contemplating a switch! He told me outright, "I would stick with Wellness". "Because it IS the best", he replied. I laughed. That's what I call confidence. And being After much thoughts and deliberation, I decided to move away from the Core range and 'downgraded' to the Wellness Complete Health Grain Free range instead. "Is it food? ", I was asked in question to Flapper's skin problem. I was insanely frustrated. It was starting to feel like no-win ever since the lawsuit surfaced. I stared at Flapper and then it hit me. For the many years that my brood, especially Flapper, has been problem free on the food, has anyone ever complimented the food, no. And now, everything is... 'the dog food'. Give Me THAT Elixir Pill For Dogs! And then a long comes this 'starving cancer' campaign. It was migraine-causing enough with the incessant shares of how dog food kills, feed your dog raw food, dog food causes cancer etc. etc.. And now starving cancer too? I shook my head on that one. If cancer was that easily starved, there should be no cancer in humans. 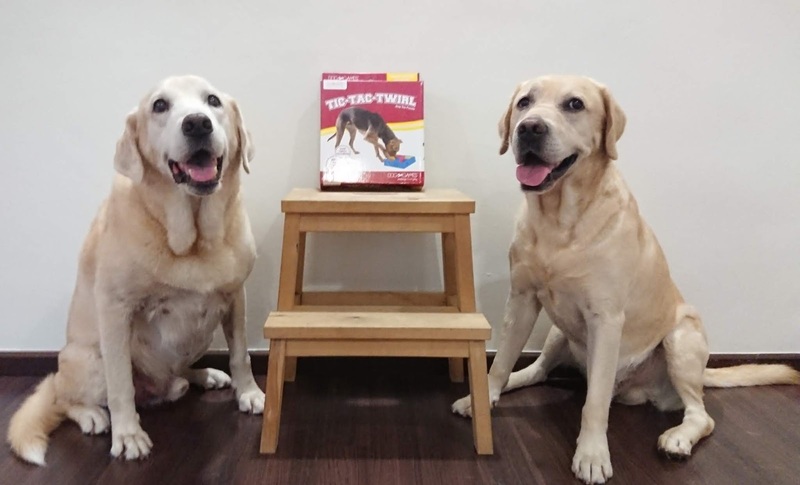 There is this growing feeling that the internet phenomenon on pet-feeding seems to indicate that it has gone beyond nutrition but rather, humans are starting to promote some kind of elixir for dog that these wondrous miracle feeds will give dogs eternal life. And what I find even more disturbing is this emphasis on the food but not much (almost nothing) mention to genetics, unethical breeding (still genetics), physical well-being, mental well-being and quality of life. A dog's well-being is not just about the food. It's the lifestyle too, no? What I find even more ludicrous is the latest video about being cruel and feeding one's dog with the same food every single day. I have no idea what kind of clinic they run but apparently they do not face the problem with fussy eaters resulting in endless buffet of food. But hang on, they have the miracle cure which means... no animals will ever fall sick again and ever need to visit the vet again. So perhaps veterinarians should consider closing their clinics pronto because there is that miracle elixir pill! Does that mean that dogs will soon live forever and have to fend for themselves? Turning 12 in September, it is always gratifying to watch Flapper indulge in his favourite activities and still enjoying his work. With all that said, I must make it clear that I am not saying that Wellness is the best feed for pets. With months of sitting on this write-up, I had much time to reflect upon whether I am 'killing' my pets by feeding commercial pet food. It does not take a rocket scientist to figure out (and accept) that any commercially-produced food - humans and pets alike - bears risk. Then I sit back at stare at Flapper. Let's be honest about it. Flapper is OLD. He is turning 12 years old in September. By a large dog average life span, he is at the stage of 'outliving' his years. Most of all, he is still able to - indulge in his favourite activities (swim, run, play), enjoy his occasional acting gigs, make silly home videos, serve the elderly, learn new tricks and most recently, perform his last (I think) stint as blood donor. I gave huge thanks (and still do) to God when his comprehensive blood works in October last year turned out good and of course, for his mobility too. At Flapper's age now, I am not taking a day for granted. Like humans at geriatric stage, health status can turn very rapidly. And of course, should Flapper or Frodo suddenly develop some health issues - i.e. cancer or kidney failure or... - I am sure the food will accused again. After much much thoughts and much much staring at the brood, surely if the food was that bad, they would all be sitting as a mantle ornament now. Surely 9 years (Flapper and the two cats), 7 years (Frodo) and 5 years (Pebbles) on the food is long enough to show its detrimental effects. But, *touchwood*, they are all still doing well except for that cockroach and her persistent skin problems. 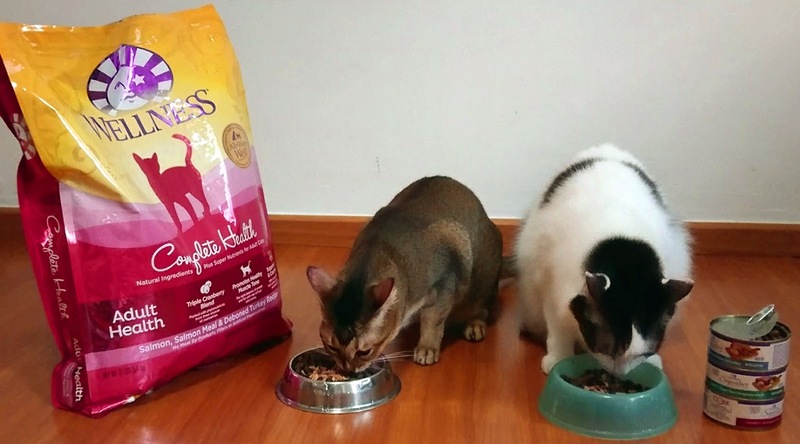 The cats on their stint on protein rotation too. They have no problem eating whichever flavour presented to them. The cats are trained to eat like the dog. Ha! Then I wonder to myself - say *touchwood again* something happens to Flapper (or Frodo) tomorrow or in the near future, maybe he gets diagnosed with cancer or kidney failure or heart failure... I don't know... just something. Will I start accusing his food of being the cause of the condition? I have to honestly say no. The boys have led a good life. Both of them have done more things and experienced more adventures in this nano-country than I could ever expected out of a large pet dog. I have a carpe diem attitude with the dogs. Of course I do pray for extended time with them but life as life is, things can happen. Maybe I did something right with my brood. Maybe I am blessed. Maybe the food did help. I really cannot answer this. But for what's it's worth, I know that creating that fulfilling and quality life beat that fussy topic about dog food. It will and always will be about the total lifestyle package and not just one element called THE FOOD. So yep, knowing that the boys are leading a quality life matters more. My biggest fear when it comes to the boys is 'what if' on the day they kick the bucket. On this note, I simply want to say a huge thank you to Wellness Pet Food for the nine good years (and still counting!) of feed for my brood of five. 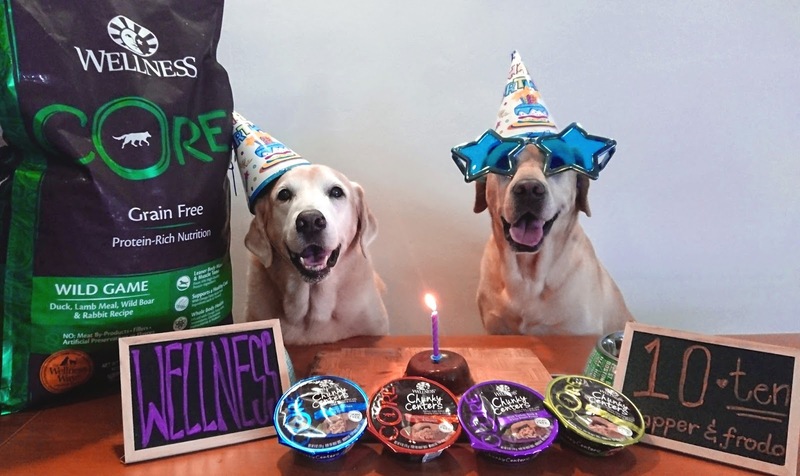 I am only but four months late but happy belated 10th birthday to Wellness Singapore!